What project could be complete without a few little mishaps? As part of our ramp up towards getting the molds created, we've been sampling the services of a few local mold makers. Ruins A, B and C went out to three highly skilled individuals. Or, in the case of Ruin B, perhaps not so highly skilled. 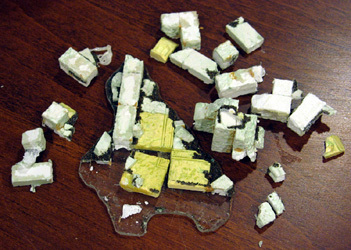 This is literally a shot of what the master looked like when I removed it from the ziplock bag he had so kindly gathered its remains in. So... 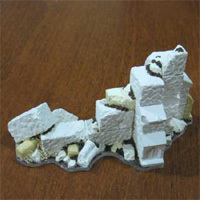 Ruin B will need to be recreated before the end of the Kickstarter project. Luckily, we have lots of pictures to go from. 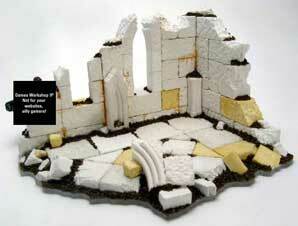 And happily, Ruins A and C were no worse for the wear as part of their mold making excursions. Domus Ruin D Has Arrived; Ruins Master Models Now Complete! 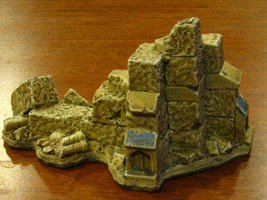 Very exciting, the master models for the Ruins are complete! We are getting very close to kicking off the Kickstarter project at this point. All that remains is writing some content, and coming up with a video that explains who we are, what we do, and why it's so great. None of us a particularly photogenic, unfortunately. Maybe we can hire a model? Perhaps Mr. Angry would like to do the video, that would be... unique! Excellent, Smithers... Domus Ruin master model #3 has hatched from it's leathery shell. This leaves one last ruin to be shown, and my sources are telling me it is almost complete. We should see it next week. At that point, all that will remain is the need to raise some funds to get professional models created for these pieces. Go Kickstarter! I realized that was a pretty poor picture of the initial ruin that I posted, so here are some better shots. This is the smallest of the four, and the one from which all the prototyping work has been done. We're starting easy, working our way up to the bigger projects. 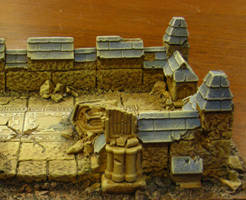 The third ruin is almost complete, and work has started on the fourth. The fourth is definitely the fanciest of the bunch, we're starting to get more confident creatively since the "manufacturing" process is getting more finalized. "Manufacturing" is definitely the wrong word, these things are virtually hand made. 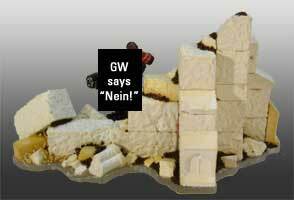 We're more like a small-batch artisanal bakery than a manufacturing facility! Finally got around to finding a replacement for the EVA foam footing. We found a great thin rubber matting, made from recycled tire rubber. It's got a nice texture on one side to make give the terrain a little more grip, and it's thinner and tougher than the EVA. The cost is only slightly more, so it's a good upgrade all around. Possibly I'm the last person on the Internet to get wind of Kickstarter, but... wow! No, we'll fire up the 'ole triple exclamations here: Wow!!! I could not have imagined a concept more perfect for the kind of small-batch creative work we do. This might actually make it possible for us to reach a larger audience. 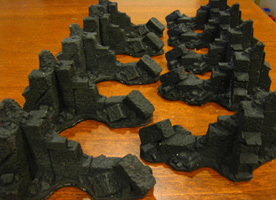 We can't produce enough terrain to meet any serious demand with our homebrew molds. However, proffesionally produced molds cost a lot. prospective buyers... all of a sudden it's possible! 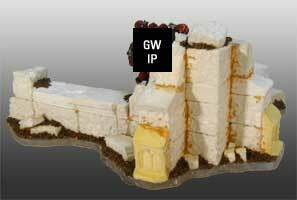 Some exciting work on the Ruins: not only have we created a mold, but we've actually churned out a few prototypes using it! 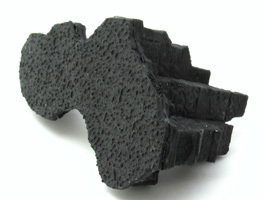 So far we are really happy with the results we're getting from this neoprene casting rubber from Critical Coatings. This rubber is great: tough, durable, flexible, holds great detail, easy to work with, non-allergenic, non-toxic, low odor. Well, we have our first "corner" created already. Not much to look at, but this is a critical piece: the master model. From this we will be able to create a mold, and from that we can crank out some copies. We started with a small piece so we can experiment a lot - there are going to be a lot of trials before we finalize on a production process. 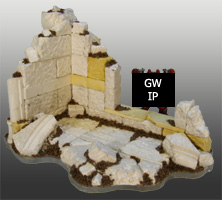 Our current thinking is that there will be four to five pieces in the Domus Ruins set: four corners, plus possibly an interior wall.